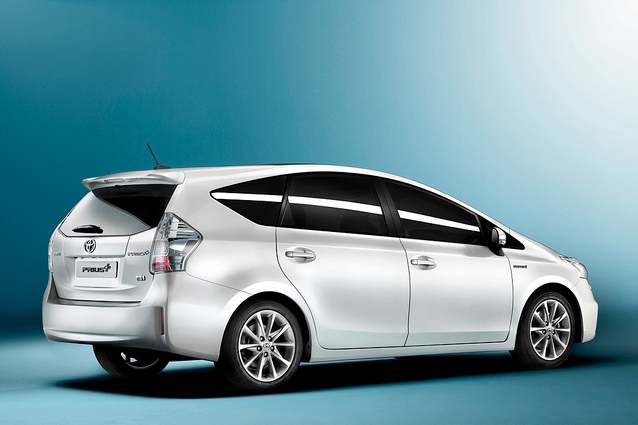 The Toyota Prius + is the only 7 seater hybrid car currently available in the UK. It uses the same petrol engine as the standard Prius but has an upgraded Lithium-ion battery which is only used in this car at the moment. It comes in a choice of two trims: the T4 and the T Spirit. Whilst not the cheapest seven seater to buy it will more than make up for this in low running costs. The 1.8 litre petrol engine combined with the electric motor means that you get reasonable performance whilst benefiting from great fuel economy. 0-60 is in 11.3 seconds on both the T4 and T Spirit models with a top speed of 102 miles per hour which is more than adequate for most drivers. And let’s face it if you are looking at a hybrid car, economy has got to be your main concern that that is where this car delivers whilst ensuring you have sufficient power to transport seven people. The seats in the Prius Plus are extremely comfortable and even at high speeds on the motorway very little road noise enters the cabin for a pleasant experience for driver and passengers. The three independent middle row seats are comfortable for adults and the fact that they are independent means that you can easily recline or move them back to suit the passenger. As is typical in all but the largest seven seaters the boot seats are only really suitable for children or for use by adults on shorter journeys. The Prius + is 27 centimetres bigger than the standard prius which enabled Toyota to fit in the extra row of seats. The other issue the designers faced when developing a seven seater prius was that the battery is usually located in the boot. This problem is solved by using a smaller lithium-ion battery and putting it between the two front seats thereby freeing up the boot for the third row of seats and extra storage. 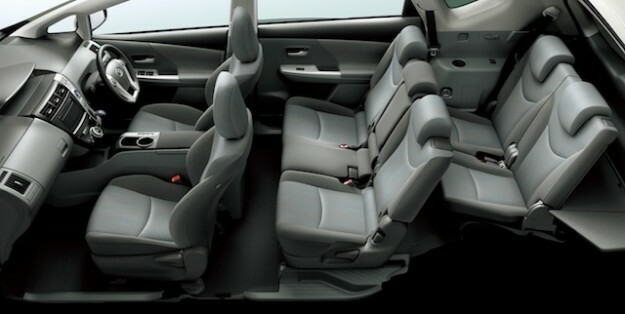 The second row features three independents seats which can all easily fit child seats. They can recline and move forwards freeing up more boot space or backwards if your passengers need more leg room. Even when using the boot seats there is still a decent amount of space for a buggy and a few small bags. In fact with all seats in place there is still 200 litres of boot space available. All the seats fold down to create a level load space for transporting large objects. The cabin in the Prius is futuristic and the dash gives the driver a lot of information. I particularly like the Heads up display which makes it easy to monitor your speed without taking your eyes off the road. All models come with an automatic gearbox and steering is light and responsive which makes driving in town a very relaxing experience. However take the car on some twisty country lanes and the driving experience is less than engaging. The Prius holds the road fairly well but doesn’t give the driver a lot of feedback. Although this car is not cheap to buy it is on running costs that you will start to recoup some of that outlay compared to other seven seater cars. The CO2 rating for the T4 version of this car is just 96g/km which means you will have zero road tax to pay and if you drive into London you will not have to pay the congestion charge. This is the only seven seater that gets under the magical 100g/km mark. Fuel economy is where this car also shines with a class leading 68.9 mpg combined. And if you are a company car driver the Prius + has a very low 10% Benefit in Kind charge. Maintenance costs should also be low on the Prius. Toyota has an excellent reliability record so there shouldn’t be any expensive repair bills and Toyota also offer a 5 year warranty as standard. Whilst the Prius + has not been available long enough to have a full Euro NCAP test the standard Prius scored highly on the 2009 test achieving the full 5 stars. There is also a long list of active safety features as standard on the plus. This includes steering assisted stability control which detects any sideways skidding and automatically controls braking and power in response. There are a number of pre-collision features which activate if the car detects that a collision is imminent including a warning on the dashboard and buzzer, tightening of seatbelts, assisted braking. The real benefit of this car is if you do a fair amount of driving around town when the car will use the electric powered motor and you will really start to get the fuel economy. However you do need to be gentle with the throttle or Prius will switch over. Of the two trim levels available I would recommend the T4 which comes in under the all important 100 g/km of CO2 and gives you the best fuel economy. If you are looking for a practical seven seater car but want excellent mpg and low running costs then the brand new Toyota Prius + could be the answer. However please also consider that some of the diesel engines on other seven seater cars get fairly close to the mpg figures of the Prius and cost a lot less to buy.